Inaue Daikurō, (here Inaue Daikurō Masatada) was a vassal of the Saitō family at the time when Katō Kiyomasa (1562-1622) was called Toranosuke. Daikurō fought with Kimura Matazō (here Shimura Masazō) while Kiyomasa was patrolling Ōmi Nagahama; Kiyomasa reconciled them and they later became his followers. Later, Daikurō achieved much distinction in the battle, including against the Chinese in Korea in 1597. There, he was admired for his remarkable achievement in fighting off a host of more than forty thousand enemies, through his successful use of rifles, and of throwing stones and trees. 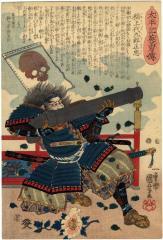 This print shows 'Inaue Daikurō' at this battle, discharging a huge cannon as if it were a gun, his sashimono (war-flag) adorned with a skull. Illustrated in Ukiyo-e dai musha-e ten - 浮世絵大武者絵展 - (The Samurai World in Ukiyo-e), edited by Yuriko Iwakiri, Machida City Museum of Graphic Arts, 2003, #77, p. 189. There is another copy of this print in the Museo Nazionale d'Arte Orientale.